We Chinese love sweet soups for dessert, there are numerous varieties. 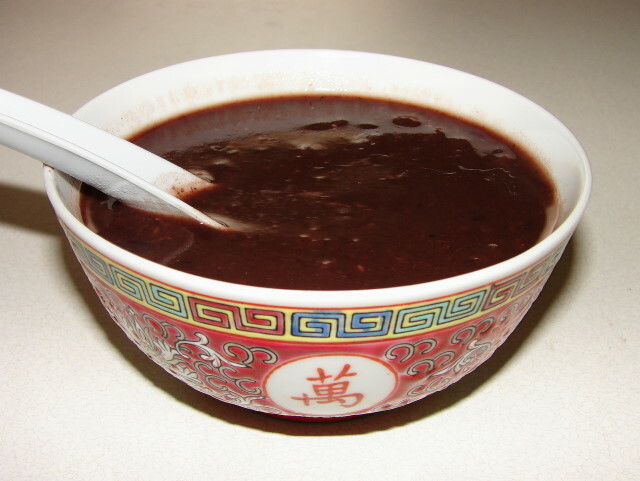 Red bean soup with mandarin peel (chan pei) is a common Cantonese dessert. It's easy to make just take a bit of time to cook. Here is how I make mine. Rinse beans and rice together. Add enough water and soak 6 - 8 hours or overnight. Drain of liquid. Put into a pressure cooker and add about 1.5 litres of water. Rinse dried peel and break into small pieces. Add to the pot with the beans, rice and water. Pressure cook (boil/simmer) for about 40min - 1 hour till beans are really soft. De-pressure pot and open lid. Add few lumps of rock sugar, add one of two lumps at a time, simmer without lid on till sugar has dissolved, taste and add more if required. If not use normal granular sugar. The soup is ready to eat. But if you like the soup smooth, blitz with a hand blender to the texture you like. For a really smooth texture, blitz longer. Serve sweet bean soup hot or cold. I like to add black glutinous rice, it thickens the soup and slows down the bean separates from the liquid and settles on the bottom of the bowl. More mandarin peel stronger the citrus flavour. If no pressure cooker can use a large sauce pan or stock pot, the beans will take longer to cook. Increase water to about 2 litres instead of 1.5 litre, boil for 10 minutes on high then simmer up to 2 hours till beans are really soft. For a richer creamy flavour, can add some coconut milk to the sweet soup. Tung yuen (sticky glutinous rice balls) goes well with this soup see this. Make a dough with glutinous rice flour and water, form into balls and boil with the sweet soup last ten minutes cooking time (not pressure cooking) till the balls float onto the surface. If you like to blitz the soup, blitz then reheat before cooking the tung yuen. If there is enough leftover soup, fill into ice lollies/popsicle container or ice tray, freeze and eaten as frozen dessert. very comforting for a cold winter day or night. 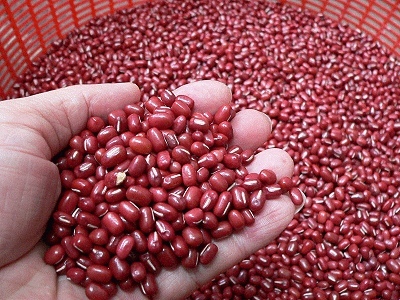 btw, have you heard of using a ceramic soup spoon to cook together with the red bean soup? Cooking with ceramic spoon, yes heard of it also good with boiling juk (rice soup). Apparently speeds up the cooking. I've not tried it will give it a go sometime. This is one of my favourite desserts..Foochows add more water to the chuk.